Why Do I Need A Labor Doula? We work as a team. To better serve our clients, we work together allowing more flexibility for prenatal appointments, and attendance at your birth. We currently have two doulas on staff, and are mentoring another. We also have more than one backup doula available at any given time in case of an emergency. Each of our doulas brings something different to the table, and we are happy to provide such diverse services: from yoga classes, to placenta encapsulation, to cloth diaper classes, we've got you covered! What Is A Labor Doula's Role? We will provide you and your partner with emotional, physical, and informational support, help you communicate your needs and desires to your birth attendants and assist in providing you with education to aide in informed decisions about your birth. support for the first few weeks. and we can also talk about your birth preferences. you decide to hire us and sign our contract. We offer a wide range of affordable packages! We accept cash, personal check, money orders, credit cards, Flexible Spending/Health Savings Account Debit Cards or Paypal. Reimbursement by your Flexible Spending or Health Savings account is possible; inquire with your Benefits Manager for more details. Health Insurance reimbursement may be possible; please check with us for more information. 2 prenatal visits. Includes Birth Wish List creation, basic Child Birth Education, Breastfeeding Education, Client Handout Folder with Breathing Techniques, Comfort Measures for Birth, and more! Access to our Lending Library of educational materials, including books and rebozos for birth. Unlimited phone, text, and email support until 6 weeks postpartum. On call two weeks prior to your 'due date'. Attendance at your home at the onset of your labor, your birth* at home or in the hospital and up to 1-2 hours afterwards, or until breastfeeding is established. Includes Basic Breastfeeding Help and Referral to a Lactation Consultant, if needed. At least one, or possibly both of us may be present for your birth. One postpartum visit 2-5 days after delivery, but no later than 6 weeks. We can also photograph your birth upon request, with your camera or mine. We are not professional photographers, but do enjoy snapping candid photos! No refunds are given for rapid labor, premature labor, failure on your part to contact us during labor, or any unexpected outcome of labor (example: cesarean, planned or unplanned). If I, or my backup doula, fails to attend your birth due to our error, then half of your fee will be returned (the first half will be payment for time spent with you in the prenatal period). GREAT for second and third time parents (or more!) who just want to have a Doula at their birth! Birth Support Only, no prenatal visits. Includes emailed Birth Wish List. Phone, email, text, Facebook support from the date you sign the contract. ​Access to our Lending Library of educational materials, including books and rebozos for birth. We can also photograph your birth upon request, with your camera or ours. We are not professional photographers, but do enjoy snapping candid photos! If I, or one of our backup doulas, fails to attend your birth due to our error, then half of your fee will be returned (the first half will be payment for time spent with you in the prenatal period). When you just want to pick the Doula's brain! Includes emailed Birth Wish List. Phone, email, text, Facebook support only, for the length of your pregnancy, until 2 weeks postpartum. Also includes email handouts on the topics of your choice. No actual in person meetings or labor/birth support. Contact me for more information. Belly Casting, Level 1 (finishing and decorating not included) - $90, approx 60 minute appointment. 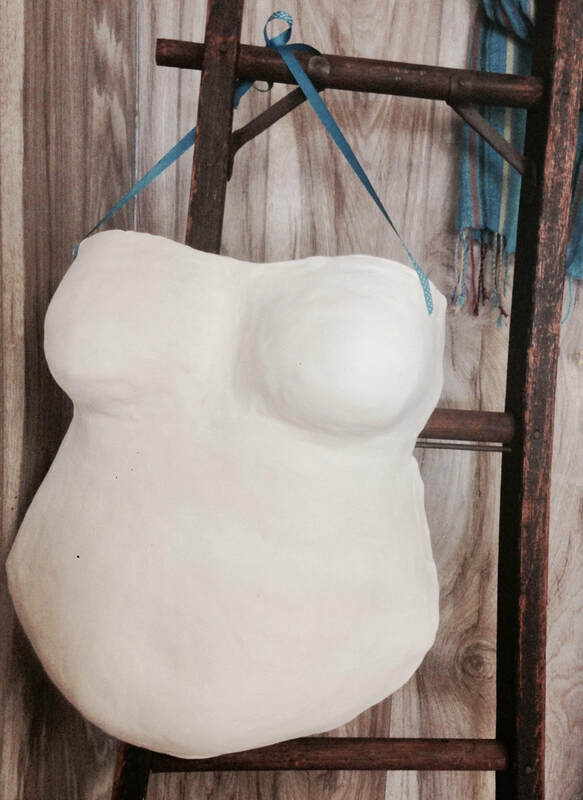 Belly Casting, Level 2 - (sanding, finishing with plaster, and primer layer of gesso, ribbon for hanging) - starting at $130, approx 60 minute appointment (finishing may take up to 1.5 weeks in my studio). ~Belly Casting bought separate from a Doula Package is payable at the time of service. Finishing & decorating your belly cast may take a few weeks, but this will be discussed in depth at the time of your appointment. Casting will be done in our studio, or the privacy of your home. I will let you know in advance if I need any supplies to be available the day of casting if done at your home. Contact me for more information.